Christine Quinn's improbable journeybegan long before she becameNew York City's second-most-powerfulelected official. The granddaughter of Irishimmigrants—including a grandmother whoescaped the sinking Titanic when most teenagegirls in steerage perished—Christinelearned early in life that challenges aremeant to be met and overcome, and thatthey are ever present but surmountable. Christine's seemingly idyllic childhood—a time that was filled with every imaginablelesson from ballet and painting to swimmingand horseback riding—wasn't at allwhat it appeared to be. A cancer diagnosisleft Christine's mother fighting for her lifeand harboring a single wish: to see herbeloved little girl through grade school. Shelived more years than she'd dared hope for,but her decade-long battle with breast cancer,kept largely secret, cast a deep shadowover young Christine's life. At sixteen, left without a mother, Christinebegan carving her own path. Inspired by herparents' example of service—and drawing onfavorite childhood books about pioneerslike Marie Curie and Frederick Douglass—Christine set her sights on work that wouldhelp make a difference in the world. Yetshe bore secrets of her own that she wouldultimately have to face, coming of age in aworld where both women and gay peoplehad no choice but to fight for their dreams.Over time she met those obstacles, bothpersonal and professional, with more fortitudethan patience. 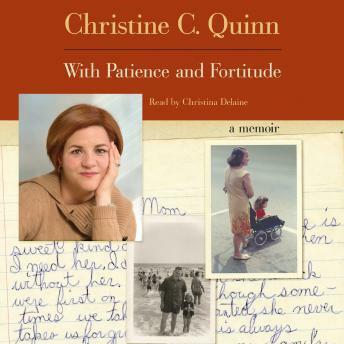 In a strikingly intimate and forthright memoir,Christine Quinn demonstrates that life'schallenges can provide the fuel that drives usto be our better selves and, in turn, inspires usto reach out to those who need a helping hand.